Today I would like to share with you 2 postcards that I received from Postcrossing. 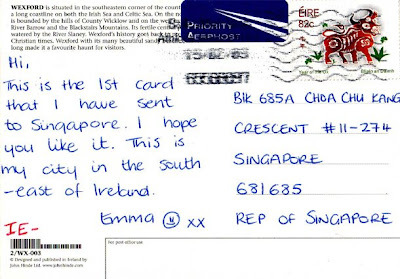 The first postcard was sent from Wexford in Ireland. 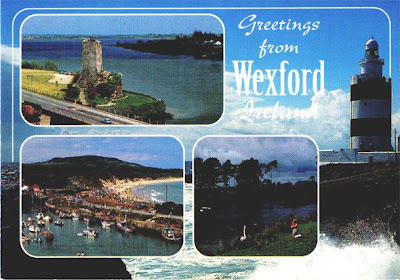 Wexford is situated near the south-eastern tip of Ireland, close to Rosslare Europort. According to a local legend, the town got its Irish name, Loch Garman, from a young man named Garman Garbh who was drowned on the mudflats at the mouth of the River Slaney by flood waters released by an enchantress. The resulting lake was thus named, Lake of Garman. The town was founded by the Vikings in about 800 AD. They named it Veisafjǫrðr, inlet of the mud flats, and the name has changed only slightly into its present form. For about three hundred years it was a Viking town, a city state, largely independent and owing only token dues to the Irish kings of Leinster. 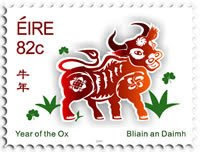 The stamp used on this cover was issued in 2009 to commemorate the year of the Ox. 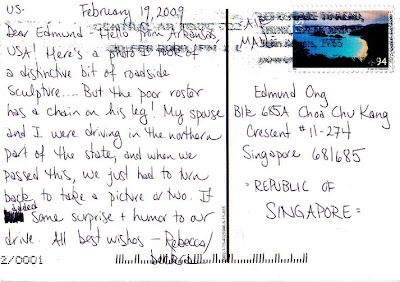 This second postcard is a home-made card. 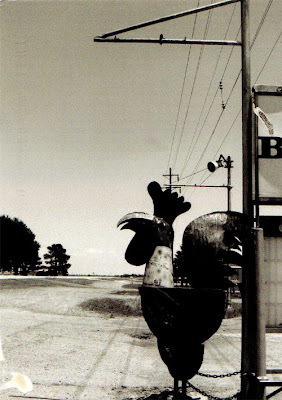 The sender, Rebecca was driving in the northern part of the state of Arkansas, USA, happened to pass by this interesting rooster sculpture and took a picture of it. Isn't it artistically taken?